New Boeing 747 NAV Mode Selector Panel. P/N 7883470-011. Boeing P/N 60B-0002-3. 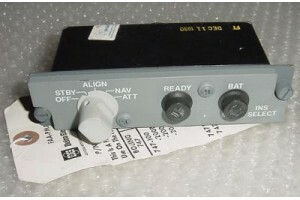 New, nos, Boeing 747 NAV Mode Selector Panel. Manufactured by Delco Electronics. P/N 7883470-011 or 671363. Boeing P/N 60B-0002-3. Also eligible for installation on DC-9s and DC-10s. Traceability paperwork available: manufacturer tag as shown on photo.